This is a small asset I created for Skywind, which is a very large Mod project involving the total recreation of 2002's Morrowind in Skyrim's Creation Engine. 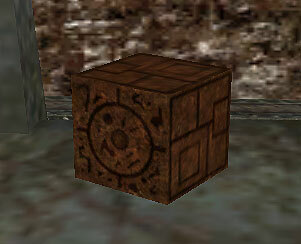 The Dwemer Puzzle Box is one of the first items you are tasked to retrieve in Morrowind's main quest line. This was an interesting asset to recreate from scratch for current-gen use, since the original was essentially just a simple cube textured with a single color map. I therefore took it upon myself as a fun challenge to re-envision the puzzle box with a high level of detail in response to the simplicity of the original. The production of this asset involved the use of new techniques and workflows for me. Mainly Substance Painter and PBR material creation, as I had never used either of those programs/workflows before. Instead of starting with a high-poly mesh to retopo and bake details from, I took a more direct approach and simply modeled the final game-ready mesh in 3DS Max first. I then imported the UV map into Photoshop and used nDo2 to immediately begin creating the normal map, which I then converted into a height map using nDo2's map converter function. Having a height map gave me a high amount of control over detailing in Substance Painter. The initial color, metallic, and roughness maps exported from Substance Painter were then completed in Photoshop.